Hyundai, which has lagged its rivals in battery-powered electric cars, aims to leapfrog that technology and roll out what it calls the world's first production fuel-cell electric vehicles at this week's Paris auto show. The South Korean automaker is betting that fuel-cell electric vehicles will be a more realistic future auto technology than pure battery electric cars such as Nissan Motor's Leaf. Those models have struggled to win over drivers as the batteries are expensive, take hours to recharge and can only drive short distances. Toyota this week scaled back plans for its all-electric eQ minicar, saying it misread the market. 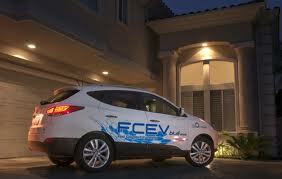 A fuel-cell converts hydrogen and oxygen into water and generating power to drive an electric motor. Fuel-cell vehicles can run five times longer than battery electric cars on a single power-up, and it takes just minutes to fill the tank with hydrogen, compared with 8 hours or so to recharge a battery. Hyundai, which has watched Toyota make the running with its hybrid Prius model, wants to jump ahead in the fuel-cell market. But it will offer just 1,000 FCEVs, based on its Tucson crossover, from December through to 2015 in Europe as it looks to more than halve production costs to $44,700. Trade media have put the initial sticker price at around $88,000, a hefty price tag for a brand that made its name with cheaper, feature-filled models. still have to wrestle with the high cost of production -- double or triple that of battery-powered electric vehicles -- and a lack of refuelling infrastructure. "We aim to reduce prices of fuel-cell vehicles to match battery cars by 2020-25," Lim Tae-won, the director in charge of fuel-cell research at Hyundai and its affiliate Kia Motors , told Reuters ahead of the Paris auto show. He said fuel-cell cars would overcome the "range anxiety" -- or fear of running out of power far from a charging point -- of battery-electric cars if the refuelling issue was resolved. A 2008 McKinsey study of 11 global carmakers predicted as many as 1 million fuel-cell electric cars on Europe's roads by the end of the decade, but industry experts caution demand will depend on customer acceptance of the technology, government aid and, crucially, the availability of hydrogen filling stations. "The great thing about a battery powered electric car is that power sockets can be found anywhere," said Andreas Winckler, managing director of the services unit of Frankfurt trade fair operator Messe Frankfurt Medien und Service, which has leased both battery and fuel-cell electric cars from Mercedes-Benz since November. "Before we installed the first charging stations here, we just opened a window and ran an extension cord out to the car." Winckler noted there was just one hydrogen filling station in the entire Rhein-Main region around Frankfurt, continental Europe's financial hub, but it had been broken for weeks. "That's clearly the big dilemma with fuel-cell cars," he said. Hyundai's Lim said it would cost more to develop a hydrogen refuelling infrastructure than one for electric battery charging, but each hydrogen station would process more cars as it would take just minutes to fill up. German industrial gases producer Linde is investing tens of millions of euros with Daimler to build 20 hydrogen filling stations by 2015. For now, Germany has only seven. The aim is to bring down the cost to that of a natural gas filling station, around 300,000 euros, or $387,500, from around 1 million euros today, said Ulrich Buenger, a coordinator at the European Hydrogen Road Tour 2012, which is funded by industry and the European Commission. In Seoul, Lim predicts fuel-cell will ultimately become the leading alternative fuel technology, though hybrids will dominate during that transition. For now, Toyota is alone in increasing sales of hybrid-electric vehicles, while General Motors, Nissan and others have struggled to live up to the hype with their early battery electric models. "Battery electric car makers entered the market too early without resolving problems such as range anxiety and costs," Lim said. "It was a hasty approach. The battery electric cars may have helped raise brand value for a couple of years, but ended up slowing down the take-off in the market." Hyundai's production-ready fuel-cell electric vehicle can run as far as 588 kms (365 miles) on a full charge, similar to traditional gasoline vehicles, Lim said, while Nissan's Leaf can drive only up to 73 miles per charge. Toyota slashed its plans for the eQ to sales of just 100 in Japan and the United States from previous forecasts of several thousand, saying battery technology could not live up to consumer demands. "The current capabilities of electric vehicles do not meet society's needs, whether it's the distance cars can run, or the costs, or how long it takes to charge," said Takeshi Uchiyamada, Toyota's vice chairman, adding that fuel-cell vehicles looked to have more potential. "The biggest problem is how automakers bring down costs and how much infrastructure will be in place," he said. Hyundai hopes to get a jump on its rivals by offering 1,000 of its FCEVs, overtaking Daimler and Honda Motor, which have leased only small numbers of their fuel-cell vehicles -- the Mercedes B-Class F-Cells and FCX Clarity, respectively. By 2015, Hyundai aims to have the capacity to build 10,000 FCEVs, rising to 100,000 in 2020, when it expects the loss-making business to achieve "economies of scale," Lim said. Toyota plans to launch sedan-type fuel-cell electric vehicles from around 2015, and predicts sales in the tens of thousands by the 2020s. Nissan is working on a fuel-cell vehicle with Daimler for 2016 and will also unveil a concept fuel-cell sport utility vehicle, the TeRRA, in Paris. GM shifted funding from fuel-cells to push Chevrolet Volt electric car with range extender, but sales have been sluggish. In a KPMG global survey of 200 auto executives, one in five expected fuel-cell electric cars to attract more consumer demand than pure battery electric cars in 2025. Sixteen percent went with battery cars. Hybrids, including plug-ins, provide the best mid-term solution, the survey, published in January, showed.